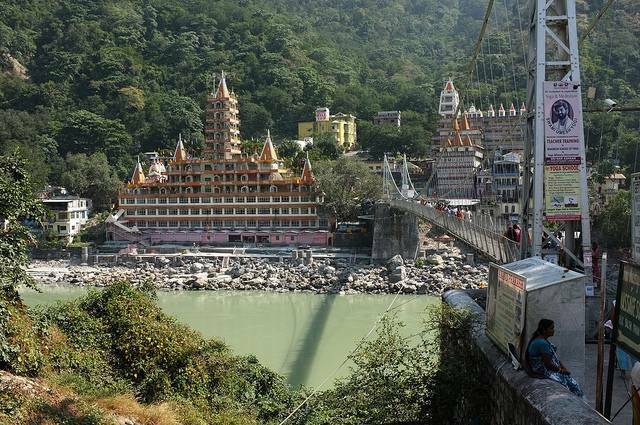 Laxman Jhula, the hanging Bridge is the main crowd puller in Rishikesh. Jhula means Bridge in Hindi. This iron suspension bridge is built across river Ganga. As per Hindu Mythology, Lord Laxman crossed River Ganges using a rope bridge in this place. The bridge was built in 1939. There are enormous stalls on either sides of Lane leading to this Bridge. It provides the tourists a thrilling experience to walk over the bridge with the river Ganges gushing underneath the bridge.